Taipei, Taiwan, is a modern city of nearly three million people. One of its most popular hotels was designed to reflect a dramatic cultural change. After Japan gained control of Taiwan from the Chinese in 1895, it set out to establish Japanese culture on the island. As one of its earliest efforts, it built a major Shinto shrine atop Jiantan Mountain in what is now Taipei. As the highest of an eventual 65 shrines, this shrine became known as the Taiwan Grand Shrine. After the defeat of Japan in World War II, Taiwan came under control of the Republic of China, with its capital in Beijing. In 1949, after losing the Chinese Civil War, Chiang Kai-Shek led several hundred thousand of his soldiers and about two million refugees to Taiwan. He proclaimed Taipei to be the provisional capital of the Republic of China, which required an effort to change the city’s Japanese look and feel. In 1952, Chiang Kai-Shek’s government began building a major hotel on the site of the Taiwan Grand Shrine. 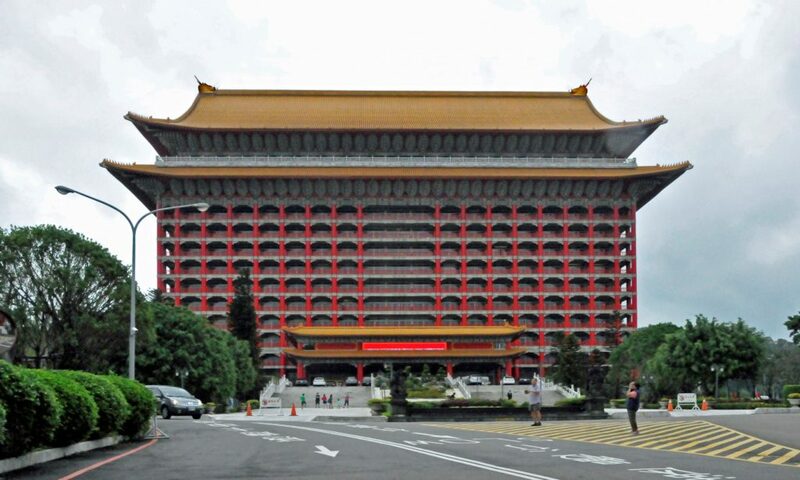 To better identify Taipei with Chinese culture, architects designed the hotel in the classic Chinese style. When finally completed in 1973, the Taipei Grand Hotel was the tallest building in Taipei and became host to many international conferences and dignitaries. Its 285-foot-high pagoda-inspired roof featured dragon heads on its corners, each pointing outwardly. During a reconstruction project in 1995, a fire broke out on the hotel’s roof that could not be reached by fire hoses, leading to the collapse of the entire roof. When the hotel re-opened in 1998, the dragon heads, traditional symbols of rain and water, were turned inwardly to help protect the roof from future fires. The presidential suite, containing Chiang Kai-Chek’s desk and his wife’s dressing table, can be rented for about $5000 a night.